The sign, “Serious Drought Help Save Water” displayed on the electronic highway board, opened up an interesting conversation about the California drought. We were heading to Half Moon Bay for an outing at the beach and hiking the coastal trail. The drought continued to be the topic of conversation as we passed the I-280 and Highway 92 interchange where a portion of Highway 92 bisects the Crystal Springs Reservoir. The effect of the drought is nowhere more evident than the reservoir low water level. We reached Half Moon Bay just as the fog lifted. We first walked the Coastside Trail that ran along the beaches and the ocean bluff. The stretch of coastal trail provided a stunning landscape of jagged promontory, cliffs, windswept trees, dramatic dunes, and ocean views that I found more intoxicating than the famous Half Moon Bay microbrew. However, the effect of the California drought on insects and birds was evident while we walked the trail. I did not see any butterflies or as many wild flowers I saw two years ago around the same area. We reached a promontory with a very dry land and huge cracks. It was fenced off with a “Danger, Unstable cliff” sign. Even the few crows that hobbled around the wind-swept trees and cliffs seemed sad-looking. We ended our hike at the beach area where I saw just a few pelicans floating on the water, not the thousands of seabirds diving for fish or fishing just offshore I saw a couple of years ago. As we passed the Crystal Springs Reservoir on our return home, the topic of conversation turned to the severe drought in California once again. My friend mentioned about the recent article in the New York Times about the scientists reporting in the Journal of Geophysical Research. The scientists assert that global warming caused by greenhouse gas emissions has probably worsened the drought in California by 15 to 20 percent, and warn that future dry spell will certainly be more severe as the planet gets hotter. Regardless of the opinions of those skeptical of climate science and the political debate about the drought as primarily a consequence of natural climate variability, I have always believed in the scientific findings citing global warming as a factor in the drought in California. Even before Governor Jerry Brown imposed mandatory water restrictions, we already started to conserve water in our household by taking shorter showers, collecting recycled water in the kitchen for watering houseplants, and recycled water in the shower for flushing the toilet, and now totally forgoing the green lawn. This short trip reminded me once again that while only the ‘Supreme Being’ is capable of creating such glorious natural landscape, humans are capable of contributing to its destruction. Half Moon Bay is 25 miles south of San Francisco, California. There are designated state beaches, and a Coastal Trail that runs along the beaches and provides a six-mile stretch to walk, hike or ride bikes, and a stunning landscape of cliffs and windswept trees and dramatic dunes and ocean views. The trail continues north to Pillar Point Harbor, a commercial and recreational fishing harbor. The dramatic jetty or “The Breakwater” that provides refuge to commercial and recreational anglers, and birds is another popular spot in Pillar Point. 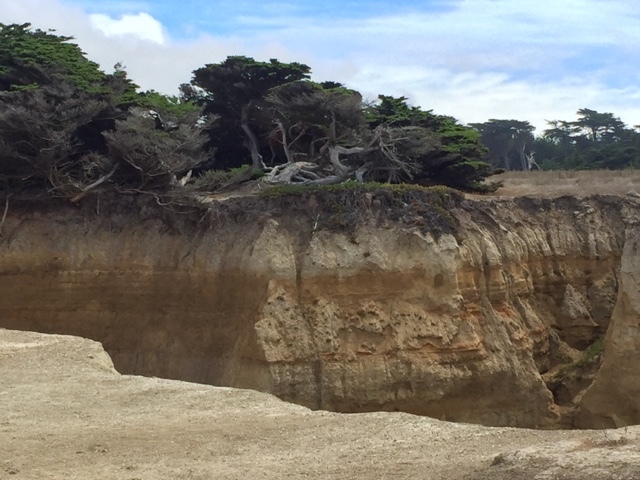 Less than ten miles of Half Moon Bay are the cities of Montara and Moss Beach with marine protected areas that help maintain marine ecosystems. Now that we’re heading into autumn, I should mention that Half Moon Bay is also a farming town and known as the pumpkin capital of the world. Oh how dry is your valley!! !